I never seem to tire of a good sunrise or sunset, yet as I grow older the more I appreciate such displays from Mother Nature. I've been told it has to do with aging and the anxiety that arrives with the passing of time recognizing that one day you'll see no more. These days as years pass days seem like hours, months melt to weeks and life's pace grows more frenetic as the years fade away. 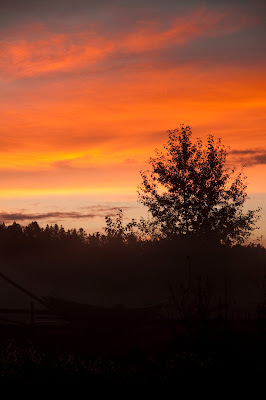 With these realities comes the significance of the simpler things in life, like this morning sunrise, the quiet drift down a free flowing river, swinging flies on a fall day, and a recognition that you get to fish just for the mere pleasure of it all. I awoke on the first day of my annual steelhead pilgrimage while others slept or stumbled for coffee scrambling around barefoot trying to capture mornings array of good light. I have taken a hundred or so dramatic photos from walkabouts of early mornings and evenings in the past. What captured my attention this particular moment was the silhouette of the abandon dory. Not that there aren't a few good photos out there with drift boats in low light, regrettably though you just don't see many of them in this part of the world anymore. 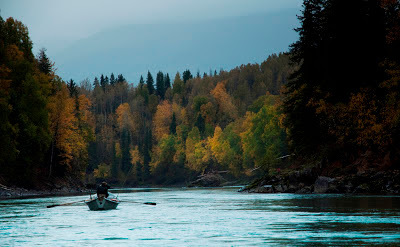 In the west dories are the preferred means of transportation when fly-fishing for trout on waters that accommodate them. What’s a Salmon Fly hatch without a flotilla of drift boats floating downstream after them? In the steelhead world where sleds are permitted drift boats have become somewhat of a rarity. It's one of the reasons I choose to fish with Derek and Andrea of Frontier Farwest. 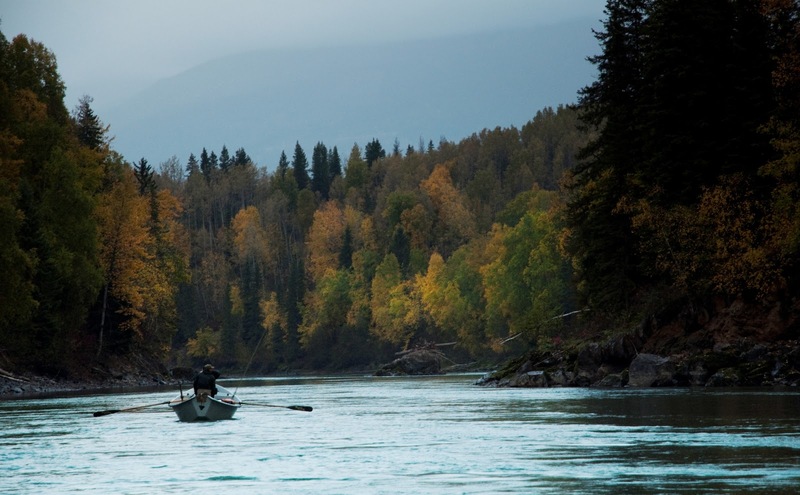 Although they've incorporated a few jet boats since purchasing this lodge from Collin Schadrach, they still use Collin's old Clackas on many of their trips. They aren't always an option, but when they are I'll take a quiet slow row down a river over the noise, smell and hectic pace motor boats lend to any steelhead day. 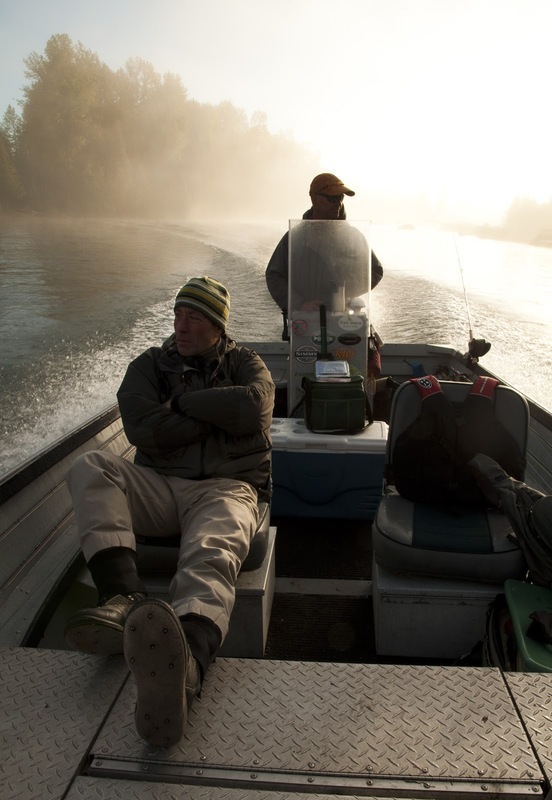 When I first traveled to British Columbia to work for Collin in 1986 he was one of only a handful of steelhead lodge operators, but the only one using drift boats to guide his clients. With only the rhythmic sound of the oars to alert others of our presence, we often surprised other unsuspecting guides as we'd slip down on them unexpectedly. Most often they would quickly gather their sports prematurely exiting the run and race to the next piece of water before we’d have a chance to get there. Often we’d slip in behind them, have a cup of coffee, some homemade cookies, before proceeding to finish what they failed to. We weren't always successful at picking their pockets, but conversely they weren't always successful in fishing their next piece of preferred water. When we did scoop a steelhead or two from their vacated pockets there was a certain satisfaction that would accompany our successes and manner in which we chose to fish. Much has changed since those early years in BC; there were far fewer guides compared to today leaving plenty of water to go around for all who shared in fishing for steelhead. The few jet boats that were on the river weren't enough to disturb much, which was good considering most lacked ethics. They're a little more considerate these days, but given that there numbers have grown considerably they have in many regards further eroded the steelheading experience. What once was a fairly peaceful semblance of compatible flyfishers at times now resembles a frantic race from run to run. 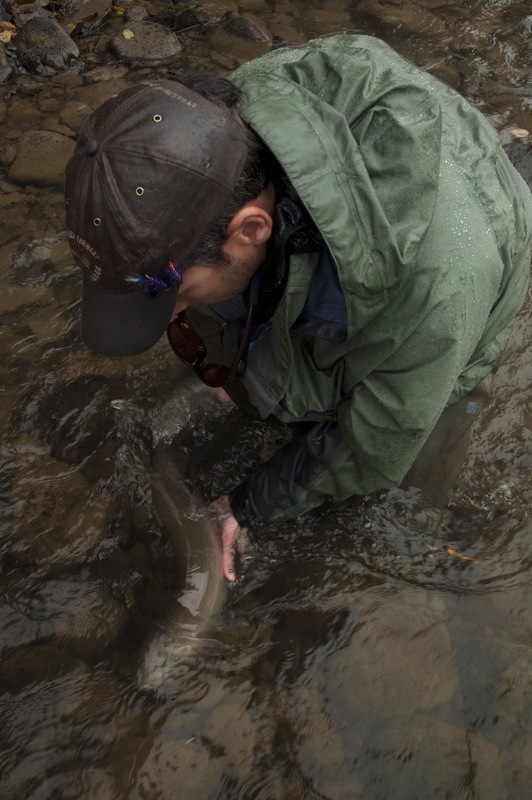 Those who prefer jet boats say they don't influence the behavior of a steelhead. From my experience I question that. When I first began fly-fishing these waters it was before two handed rods were popular and all we ever needed were dry flies. Today finding someone who steelhead fishes with a single handed rod is as rare as finding a steelheader who fly-fishes for these fish with waking flies let a lone just a floating line. One of the reasons dry line steelheading on many rivers in this region and in the lower 48 is no longer very successful is the traffic has changed, fishing for these wandering fish becoming that much more challenging. 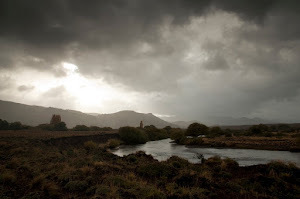 Those who fish tips don't notice the changes as much or realize that many of BC's rivers and others throughout the Northwest were known for their dry fly and dry line steelheading. Today such is rarely a consideration. If it is what was once common place is now simply an after thought. Although my numbers are not what they use to be, I find the challenges of steelhead fishing with a wet or dry fly even more rewarding than it was several decades ago. Those I fish with who also remain steadfast in this stubborn endeavor having such an appreciation for a steelhead that will rise to a dry or greased line fly that they to remain stubborn in their dedication regardless of the conditions as well. As you get older and you've been at this game for a while, success and pleasure from fly-fishing comes in a variety of forms. If you’re fortunate you’ll realize it’s not about how many fish you catch, but the methods in your madness and that the most memorable are not always the fish that come to hand. I think that’s what fly-fishing is all about, what attracted me to it in the first place and what makes the rewards of steelheading with a floating line that much more enjoyable.